By their nature, special operations are secretive and discreet. Unless something goes wrong, we might never hear about them at all. But the Pentagon does have to restock the fuel, ammunition, and other materials troops use on those missions, just like any other. If the the number of rockets burned through in the past few years by the U.S. Army’s 160th Special Operations Aviation Regiment (SOAR) is any indication, that unit has been particularly busy. In June 2016, the Pentagon sent its omnibus budget request to Congress. In it, the Army asked for a little more than $20.2 million to buy an extra lot of more than 19,000 70mm Hydra rockets of various, unspecified types. The “funds are required ... to replenish unguided rockets expended by the 160th Special Operations Aviation Regiment (SOAR) in direct support of Operation Freedom’s Sentinel and and [Operation Inherent Resolve] and in pre-deployment training,” the request explained. In January 2015, the Pentagon officially renamed the American mission in Afghanistan Freedom’s Sentinel. Inherent Resolve is the U.S. moniker for the fight against Islamic State in Iraq and Syria, which officially began in October 2014. AH-6 firing rockets during joint training. We don’t know what kind of rockets the regiment employed in any of these instances. The Hydra family includes a variety of warheads connected to a common, modular rocket motor. The additional rockets could have been a mix of versions packed with high explosive filler, visible or infrared flares, small metal darts called "flechettes," or red or white phosphorus, as well as dedicated training types. On top of that, the Pentagon’s “Rocket, Hydra 70, All Types” line item included the new, laser-guided Advanced Precision Kill Weapon System II (APKWS II) variant. Able to slot in between the motor and the warhead, the APKWS II kit can turn an unguided rocket into a far more deadly precision-guided missile, giving aircraft an added punch. In 2015, the upgraded rockets were the primary armament for a pair of refurbished OV-10 light attack aircraft during secretive missions in Iraq. The year before, a U.S. Marine Corps MV-22 Osprey fired some of the weapons during a series of test flights. We also do not know how many rockets 160th SOAR fired in combat versus practice sessions, or how long it took them to shoot all of them. At the time of writing, U.S. Army Special Operations Command’s public affairs office had not yet responded to a query about the figures. However, given the operations Pentagon officials noted and the date of their request, the period of expenditures should have been around 21 months. That’s an average of more than 900 rockets every month. That’s a lot, especially for just one unit. 160th SOAR aviators do most of their work at night. Fighting in an MH-6 is "intimate" with crews coming very close to their targets. Consider that, in the Pentagon’s Fiscal Year 2016 base and “overseas contingency operations” budget requests, the Army included plans to buy more than 125,000 Hydras of all types. In the defense budget outlined for the next fiscal year, it asked a little more than 74,000 rockets. That’s approximately 199,000 rockets in total. The 160th SOAR’s expenditures are equal to 10 percent of those purchases. And they rippled off all those Hydras in less than two years in and while preparing for combat. That’s impressive. It’s even more so when you realize not all of the regiment’s helicopters can even fire these weapons. 160th SOAR has approximately 51 A/MH-6M Mission Enhanced Little Birds (MELM), according to one 2016 briefing. The unit had another 72 MH-60M Black Hawks. Only some of each type can employ rockets. The MELBs are the latest evolution of the Army’s iconic Little Bird family. The nimble, single-engine helicopters are a significantly advanced outgrowth of the Vietnam War-era OH-6 scout choppers. With a crew of two, the MH-6M variant can carry another six special operators on special platforms on either side of the fuselage. Able to cruise at speeds over 100 miles an hour, the tiny transports can insert teams of elite troops into relatively small spaces, as well as perform scout and command and control missions, if necessary. But these versions have no weapons. The AH-6M is the gunship configuration of the same helicopter, able to carry a mix of machine guns, rockets, and missiles on a special weapons rack installed in the main cabin. 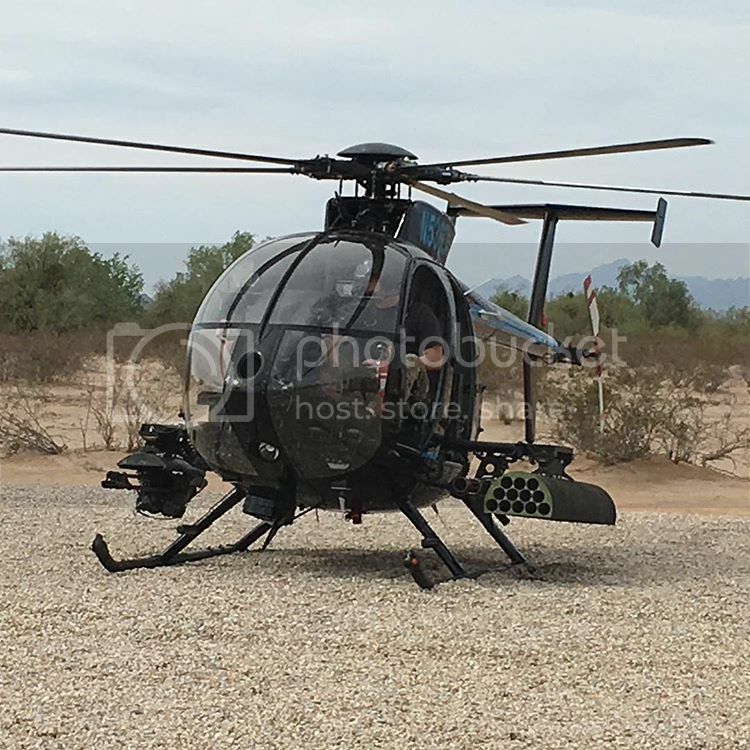 In publicly available images, these diminutive attackers—sometimes referred to as “Killer Eggs” because of their armament and distinctive shape—regularly carry two fast-firing 7.62 mm Miniguns and two M260 seven-tube 70 mm rocket pods. While the AH-6Ms can technically carry the 19-round M261 pods, they reportedly sit dangerously close to the ground, making rough terrain landings problematic. In addition, while the weapons planks fold up so crews can rapidly load and unload the choppers from C-130 transport aircraft, this doesn’t work with the larger rocket packs in place. Defense contractors Dillion Aero and Fulcrum Concepts have both experimented with a modified M261 design for the Little Bird, using only half the pod, which can old 12 Hydras. Another company, Arnold Defense, offers a similar model, the LWL-XII-A, weighing less than 60 pounds empty. As with the Little Birds, not all of the twin-engine MH-60Ms are set up for attack missions. A subset of those choppers, known as Direct Action Penetrators (DAP), have provisions for a broad array of weapons, including Hydras, in addition to more traditional defensive machine guns. Stub wings fitted above the crew chief windows on these Black Hawks can carry any of the standard rocket pods. The larger, more powerful MH-60s have no problem carrying M261s. So, it was highly trained Army aviators flying less than 150 helicopters who were responsible for shooting off all of those 19,000 rockets. To put that in perspective, the Army and Army National Guard have more than 700 AH-64 Apache gunships. Remember that, in fiscal years 2016 and 2017, the service felt buying less than 200,000 more rockets would be adequate to replenish supplies for regular and special operations training and combat purposes. 160th SOAR is the Pentagon’s main supplier of helicopter support for special operations around the world. After 9/11, the regiment’s four battalions repeatedly deployed on counter-terrorism missions to countries such as Afghanistan, Iraq, and the Philippines. The elite fliers routinely bring their aircraft to training exercise from Europe to Africa to Asia. On May 2, 2011, they took part in the famous raid in Abbottabad, Pakistan, where members of SEAL Team Six killed Al Qaeda leader Osama Bin Laden. The regiment has been shuttling special operators around Iraq and Syria for years now, as the U.S.-led coalition helps Iraqi and Kurdish forces battle Islamic State terrorists. In November 2014, U.S. Central Command let slip video of MH-60M transports refueling in midair and on the ground in Iraq. Two years later, the unit’s larger MH-47G Chinooks were among some of the first visitors to the newly liberated and repaired Q-West air base south of Mosul. In February 2017, photojournalists inside the still contested city caught a glimpse of another MH-60M, again without rockets. With Islamic State still holding on in Iraq and Syria, franchises spreading elsewhere in the Middle East and North Africa, Al Qaeda still a threat, and the Taliban and its allies resurgent in Afghanistan, it looks like there won't be much rest for the 160th SOAR. We can probably expect the unit to fire off thousands more rockets in the near future—whether we ever know about it or not.